This is a basic recipe for chili oil. Once you’ve got the technique down, feel free to jazz it up by adding garlic, ginger, cumin, sugar or other spices. To make it even hotter, add more dried chilis or reduce the oil to 1/3 cup. The chili oil can be used almost immediately, but for best results leave the oil for a day to allow the flavors to blend. Cut off the stems of the dried chilis and remove the seeds. Chop the chilis into coarse flakes (it's easiest to do this by processing them in a blender for about 20 seconds). Handle the chile peppers with care. The oil in capsicum can be very dangerous for your skin and eyes. 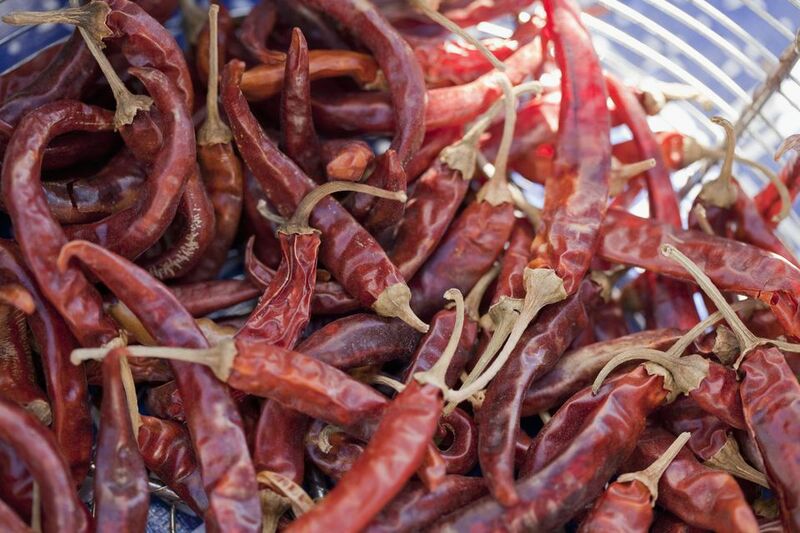 You may want to wear plastic gloves when handling the chili peppers. Be sure to wash your hands thoroughly with soap and water afterward. Place the chili flakes in a heat resistant jar with a seal. Heat the oil in a heavy skillet over medium-high to high heat until it is starting to smoke. Continue heating the oil for 20 to 30 seconds. Remove the skillet from the heat. Wait 3 minutes, or until the oil has cooled to 225 – 240 F (107 to 122.5 C). Pour the oil over the flakes. Add 1 tablespoon sesame oil if using. Cool and strain the oil. (Be sure to save the chili flakes to use in other recipes). Leave the chili oil for at least 1 hour to give the flavors a chance to blend (longer if adding sesame oil). Use as desired in recipes or as a dipping sauce with dumplings and noodles. Stored in a sealed container in the refrigerator, chili oil will last for at least one month.